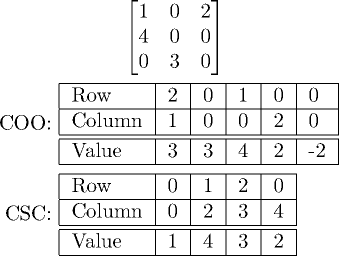 I have been writing a sparse matrix library for few weeks and for it I needed a algorithm for converting from coordinate list form(COO) matrix to compressed sparse column form(CSC). All of the algorithms that I found allocated space for the CSC matrix and freed the COO matrix after building the CSC matrix. This is inefficient when I know that I don't need the coordinate list matrix after building the CSC matrix. So I decided to make an algorithm that can convert the matrix in-place. Same matrix in COO and CSC formats. COO formats order is arbitrary. This time the Column array in CSC is the same length as number of non-zero entries, but in general its length is columns in matrix + 1, or one less if you leave the last optional element out. If you look at the above CSC and COO formats of the example matrix, it should be clear that CSC formats Value and Row arrays are just sorted COO formats Row and Value arrays. Only problem is the Column array but it can be built easily from the sorted Column array. We just need to compare current element to previous element and if they are not equal set the next unset element to be the current loop iteration. Because we want to sort the arrays in-place first choice for the sorting algorithm is Quicksort. I know that it really requires O(log n) of space in the stack because of the recursion, but in reality it's less than 1kB even for a several gigabyte big matrices so we don't really need to worry about it. We need to sort both Row and Col arrays, such that Row is sorted first and then Col, but there is no need to make two passes as we can just define our comparison such that the Quicksort algorithm sorts both arrays at the same time. Below is the full algorithm and the same example matrix as above. This algorithm is fast enough for me but if you want to optimize it take a look at the glibc's qsort, which is very efficient Quicksort implementation.